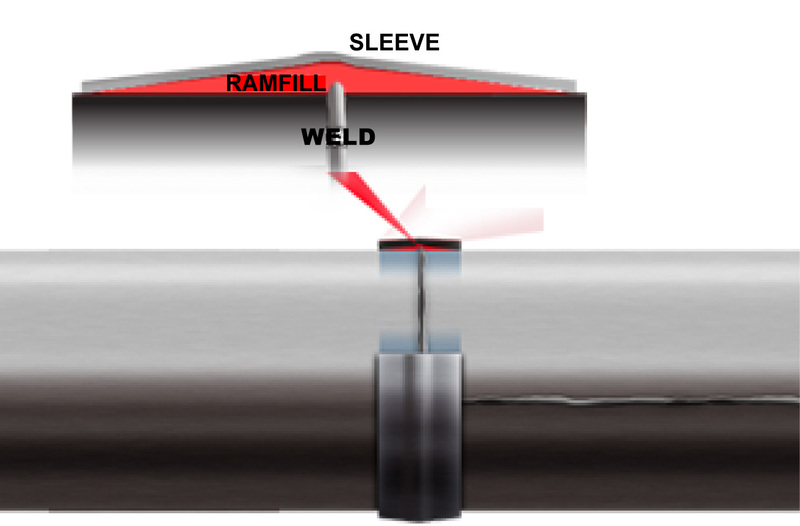 RAMFILL-RS is a boiler-type repair sleeve for reinforcement of weld deficiencies. Its pyramidal design and a convex bent in the center to properly fit the existing weld to be repaired is a Patented Product in Mexico (Patent # MX/a/2011/005026). 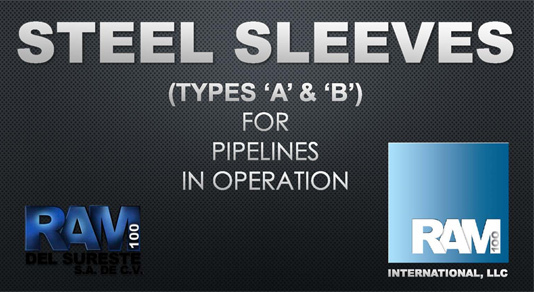 Its geometric shape improves the mechanical stress resistance of the sleeve. It is manufactured without welds, with specifications, diameter, and thickness, as requested by each project. The traditional length for RAMFILL-RS sleeves is 0.25 m (10”), but sleeves can be custom made as needed or required by specific conditions of the pipeline or deficiency to be repaired, or as requested by the customer. 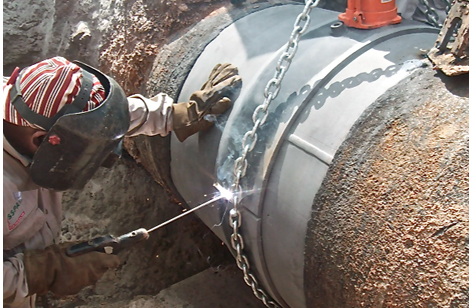 Once installed, the RAMFILL-RS sleeve restores safety of operation to the pipeline in the area where the welding is reinforced by restoring the stress resistance to equal or higher values of the original conditions of the pipeline. When required for repairs on gas pipelines, and depending on availability in the market, or when requested by the customer, RAMFILL-RS sleeves can be manufactured from API pipes instead of steel plates. RAMFILL-RS repair sleeves are manufactured to fit perfectly on the pipeline to be reinforced, which allows for a fast and easy installation. The installation kit includes RAMFILL epoxy resin to saturate the annular space formed between the pipe and the sleeve, creating an incompressible element that acts as a transmitter of stress from the pipeline to the sleeve. This incompressible resin is for manual application and it can be provided in a semi-liquid state for pressure injection, as requested by the customer.